Liberals on the attack to discredit John McCain are not wasting time but are investing a lot of money. They know they have to do it before the national debate begins. They know once the primaries are over and their candidate have to face one on one with John McCain, they will be at the defensive. So, today is the New York Times with an unfounded story in the front page resembling the covers of tabloid magazines displayed at cashier counters in grocery stores. The credibility of this newspaper is going down the drain. "This is the same paper that gave MoveOn.org a sweetheart deal to run advertisements attacking General Petraeus --. We better get ready for more of the Democrats' attacks over the coming months as the Democrats pick their nominee, MoveOn.org starts spending their unlimited soft money, and the liberal media tosses standards aside in an attempt to stop our momentum." "Objective observers are viewing this article exactly as they should - as a sleazy smear attack from a liberal newspaper against the conservative Republican frontrunner. Sean Hannity said, after reading the article three times, "It was so full of innuendo and so lacking of fact, and so involved in smear, I came to the conclusion that the goal here was to bring up a 20-year-old scandal." Washington attorney Bob Bennett, who was the Democrat counsel during the Keating investigation, said, "This is a real hit job." Joe Scarborough called the allegations "outrageous." Even pundit Alan Colmes -- not known for his conservative leanings -- concludes "this is a non-story." We must unite our efforts and help John McCain to continue his campaign for the nomination . Posted by Haydee Florez : Post Link --> 1:29 PM 1 Comments - Share Yours! IS SENATOR OBAMA KEEPING HIS WORD REGARDING PUBLIC FINANCING AGREEMENT FOR THE GENERAL ELECTION? OR HE WILL CONTINUE EVADING THE QUESTION? THE DEMOCRATIC CANDIDATE SHOULD EXPLAIN HIS POSITION ON THIS ISSUE. HE OWES THAT TO AMERICAN VOTERS. Posted by Haydee Florez : Post Link --> 6:57 AM 0 Comments - Share Yours! Posted by Haydee Florez : Post Link --> 10:03 AM 0 Comments - Share Yours! Posted by Haydee Florez : Post Link --> 9:19 AM 0 Comments - Share Yours! AN INDEPENDENT STUDY ON CONGRESSIONAL EARMARKS; BY A NONPARTISAN BUDGET WATCHDOG GROUP, REVEALS THAT SENATOR MCCAIN IS THE ONLY PRESIDENTIAL CANDIDATE THAT REJECTS EARMARKS ENTIRELY, PART OF HIS LONG -STANDING VIEW,THAT SUCH MEASURES PROMPT NEEDLESS SPENDING. THAT THE AMOUNTS SECURED BY THE DEMOCRATIC PRESIDENTIAL CANDIDATES FOR EARMARKS ARE WORTH MILLIONS. WHILE THE GOP FRONT-RUNNER JOHN MCCAIN ABSTAINED. "Senator Obama has been criticized for using a 2006 earmark to secure money for the University of Chicago hospital where his wife worked until last year. Senator Clinton helped secure more than $340 worth of home-state projects in last year's spending." "The new report, by Taxpayers for Common Sense, is the first to show all the earmarks each lawmaker added to spending bills for an entire fiscal year. It notes the explosive growth of the practice, which amounted to more than $18 billion in fiscal 2008." Posted by Haydee Florez : Post Link --> 6:59 AM 0 Comments - Share Yours! HOUSTON, WE HAVE A PROBLEM!! Republicans campaigning for president in South Carolina are routinely called upon to take a position against the Palmetto State's flying of the Confederate battle flag near the Capitol in Columbia. Imagine what would happen if reporters found the stars and bars flying in a GOP candidate's campaign office. Some campaign worker would be out of a job, and the candidate himself would have great difficulty living it down. Not surprisingly, this is a story about media double standards. 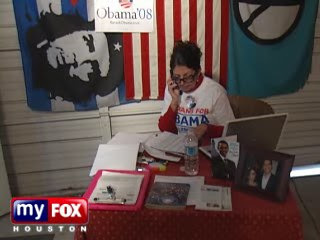 The Little Green Footballs blog notes that cameras from Houston's KRIV-TV caught a glimpse of a different invidious flag hanging on the wall of what the narrator describes as a new Barack Obama campaign office in Texas' largest city. 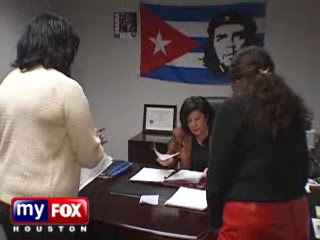 During a report on the run-up to the March 4 Texas primary, the KRIV camera pans past a Cuban flag with an image of Che Guevara, an ally of communist dictator Fidel Castro. Guevara presided over show trials and executions of Castro enemies after the communist takeover of Cuba in 1959 before leaving Cuba in 1965 to foment terror and revolution elsewhere in the Third World. Does Che Guevara symbolize the kind of "change" Barack Obama wants to bring to America? Posted by Haydee Florez : Post Link --> 5:06 AM 1 Comments - Share Yours! ARE WE WILLING TO INJECT THE ENTHUSIASM NEEDED TO WIN THE PRESIDENCY? OR WE'LL SIT AT THE SIDE OF THE ROAD AND SEE HISTORY PASS BY? THERE ARE BIG ISSUES AT STAKE IN THIS ELECTION!!! WILL REPUBLICANS CONTRIBUTE TO THE DEMOCRATS WORST NIGHTMARE??? WE NEED TO ENERGIZE OUR PARTY AND WORK TOGETHER AND HELP MCCAIN WIN IN NOVEMBER!!! Posted by Haydee Florez : Post Link --> 8:59 AM 3 Comments - Share Yours! I am proud to be a conservative, and I make that claim because I share with you that most basic of conservative principles: that liberty is a right conferred by our Creator, not by governments, and that the proper object of justice and the rule of law in our country is not to aggregate power to the state but to protect the liberty and property of its citizens. And like you, I understand, as Edmund Burke observed, that "whenever a separation is made between liberty and justice, neither . . . is safe." Often elections in this country are fought within the margins of small differences. This one will not be. We are arguing about hugely consequential things. Whomever the Democrats nominate, they would govern this country in a way that will, in my opinion, take this country backward to the days when government felt empowered to take from us our freedom to decide for ourselves the course and quality of our lives; to substitute the muddled judgment of large and expanding federal bureaucracies for the common sense and values of the American people; to the timidity and wishful thinking of a time when we averted our eyes from terrible threats to our security that were so plainly gathering strength abroad. It is shameful and dangerous that Senate Democrats are blocking an extension of surveillance powers that enable our intelligence and law enforcement to defend our country against radical Islamic extremists. This election is going to be about big things, not small things. And I intend to fight as hard as I can to ensure that our principles prevail over theirs. Posted by Haydee Florez : Post Link --> 3:14 PM 0 Comments - Share Yours! I am a Republican because, like you, I want to relieve the American people of the heavy hand of a government that spends too much of your money on things you neither want nor need, while failing to do as well as we should the things none of us can do individually. I am a Republican because, like you, I believe government must defend our nation's security wisely and effectively, because the cost of our defense is measured in losses so hard to bear and in the heartbreak of so many families. I am a Republican because, like you, I believe government must respect our values because they are the true source of our strength; and enforce the rule of law, which is the first defense of freedom. I am a Republican because I believe the judges we appoint to the federal bench must understand that enforcing our laws, not making them, is their only responsibility. I am a Republican because I believe, like you, that government should tax us no more than necessary, spend no more than necessary, and keep out of the way of the most industrious, ingenious, and optimistic people in the history of the world . I am a Republican because I believe, like you, that it is the strength, courage, wisdom and patriotism of free people -- not the government -- who have made this country the extraordinarily successful place it is. My friends, my purpose is to preserve and strengthen our freedom, the freedom I have defended all my adult life, and I will not let anyone or anything deter me. Michael J. Boskin is T. M. Friedman professor of economics and Hoover Institution senior fellow at Stanford University and former chairman of the President's Council of Economic Advisers. A successful society needs a government that performs essential functions well, not a bloated bureaucracy trying to be all things to all people. Foremost among those essential functions are defense and homeland security. We need to weed out waste, target programs to those truly in need and prevent taxes from rising to levels that threaten our economic future. I previously supported Rudy Giuliani because of his record of controlling spending, cutting taxes and improving public services to turn around a New York City plagued with rampant crime and fiscal chaos. I also have a very high regard for Mitt Romney. 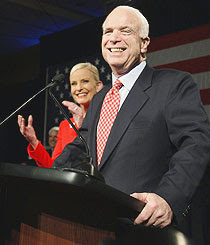 But I now believe the person best suited to the crucial tasks confronting the next president is John McCain. Throughout his career, McCain has been a champion of the war against government waste as well as a wise steward of our national security. He is a leader willing to do what is right, even if it is not currently popular. And by broadening the appeal of the Republican Party, he will strengthen our two-party system. By virtue of his leadership, his integrity, his experience and his tax, spending and defense policy, McCain is the best choice to lead America forward as we confront these many challenges. That's why I have endorsed his candidacy for president. Posted by Haydee Florez : Post Link --> 10:29 AM 0 Comments - Share Yours! ALSO THE LOS ANGELES TIMES ENDORSES JOHN MCCAIN ON THE REPUBLICAN PARTY. Posted by Haydee Florez : Post Link --> 11:56 AM 1 Comments - Share Yours! 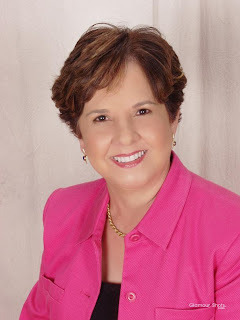 Posted by Haydee Florez : Post Link --> 9:40 AM 0 Comments - Share Yours! IT IS PITIFUL TO WATCH INTELLIGENT PEOPLE TO EXPRESS THEMSELVES, AS MS.COULTER DID LAST NIGHT. EXTREMISM HAS NEVER ACHIEVED GOOD RESULTS IN ANY CONTEST. AS A CONSERVATIVE REPUBLICAN, MY VOTE AND EFFORT WILL ALWAYS BE ON THE SIDE OF THOSE WHO BELIEVE IN A FAIR AND NOBLE AMERICA FOR ALL. SOMEONE CAPABLE AND ABLE TO REACH OUT TO EVERYONE AND GET RESULTS. SOMEONE WITH GOOD JUDGEMENT AND CHARACTER TO LEAD AMERICA DURING THESE DIFFICULT TIMES IN HISTORY; AND KEEP OUR COUNTRY SECURE, FREE AND PROSPEROUS IN THE XXI CENTURY. Posted by Haydee Florez : Post Link --> 9:25 AM 0 Comments - Share Yours!